View from the hills at the Six O Ranch, 12/2010. Entrance, photo by Jim Edmondson with Optical Harmonics, 12/2010. Click on the address above for the Google Map Link. From 35W south of Fort Worth, take 67 west past Cleburne towards Glen Rose and turn south (left) on Park Road 21. 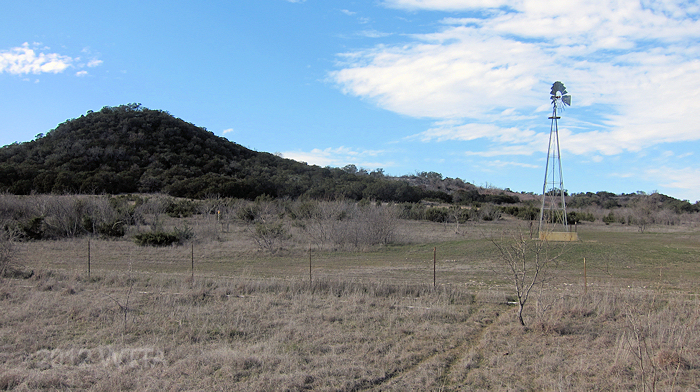 Go approximately 7 miles, pass the State Park and Lime Co on the right, and take the first right onto FM 200. 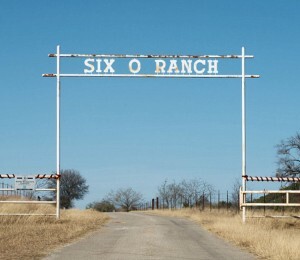 Six O Ranch will be on your right, there will be a sign and white pipe gate entrance. Use of the trails is by appointment only. $10.00 per rider a day. Overnight Camping is allowed by permission only. Running water is available for use at the ranch. Chemical toilets are available when there is an organized competitive trail ride event, but when there is not an event there are no restroom facilities. Trailer parking is spacious and is located in front of the house. There are no electrical hook ups or pens. Six O Ranch offers 35 miles of riding trails. 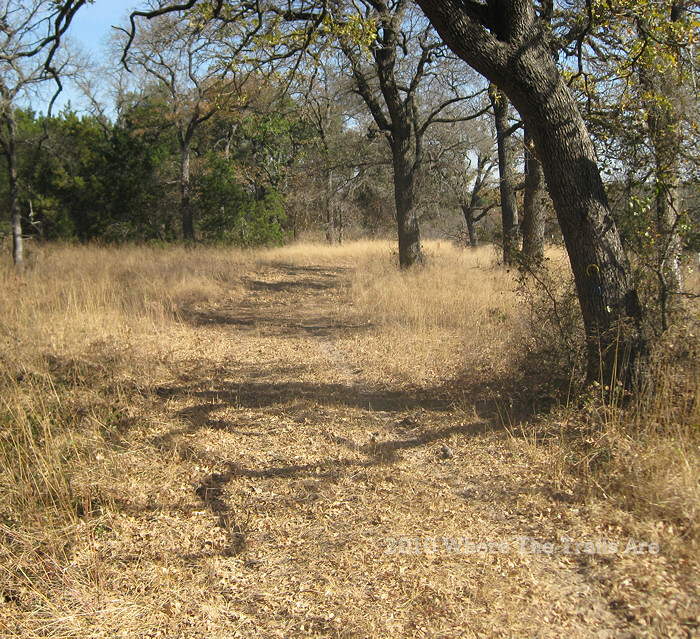 The ranch consists of varied terrain from open fields with soft easy footing, rocky hills, and shaded wooded trails. 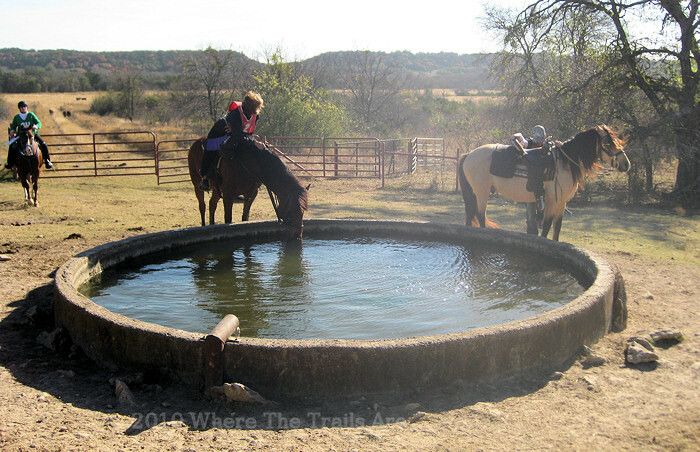 There are watering opportunities at the ranch by way of tanks, creeks, and water troughs. A large lake, at least fifty acres in size, is also located on the southwest side of the ranch. Water stop with a view of the hills in the background. The trough is deeper than the ground surface so don't allow your horse to step in. Shady trails at the Six O Ranch, 12/2010. 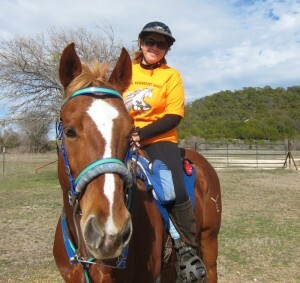 Liz Earley-Scott on her Quarter Horse, Rudy, is a regular at the Six O. Liz loves and knows these trails well. The Six O Ranch, located just outside of Cleburne, in North Central Texas, is a family owned and operated working cattle ranch managed by Ted and Kim Reeves. 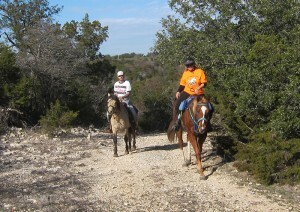 The ranch often hosts organized competitive trail rides or other trail events and welcomes day riders by appointment for just $10.00 per rider. A negative Coggins will need to be presented. 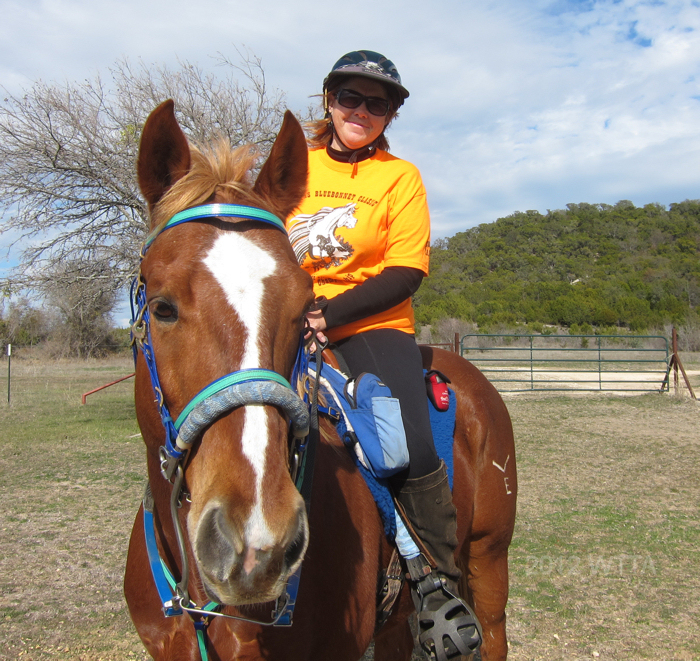 This lovely Central Texas ranch offers a variety of terrain, and with 35 miles of riding trails it is definitely worth visiting. The hills are rocky with some mild to moderate grades, some of the trails are shaded with cedars and oaks, and other trails are wide open with no shade or cover. The varied terrain is a real plus in providing opportunities to work on teaching your horse to watch their step and enjoying stretching out at a faster pace in the open fields and good footing. 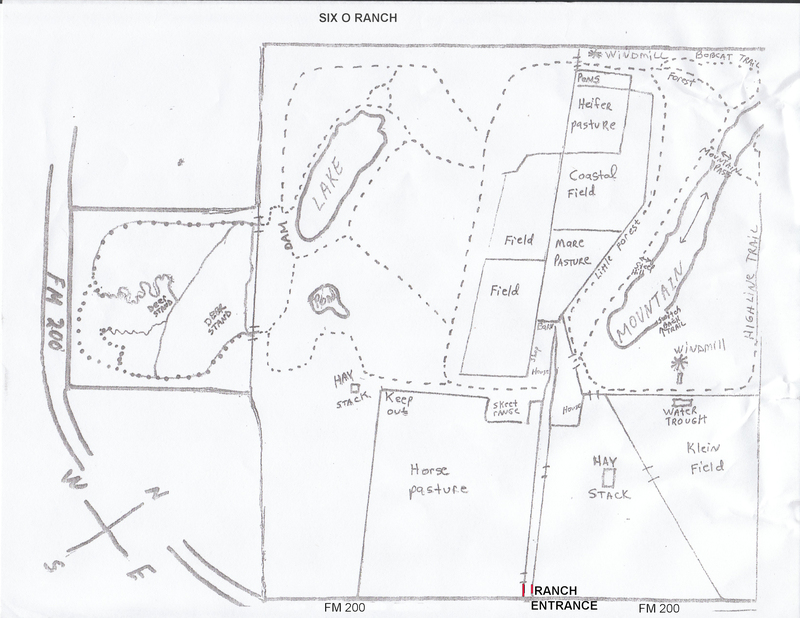 Watering opportunities for your horse are quite adequate on the trails by way of tanks, creeks, and water troughs with what appears to be functioning windmills. Be cautious at the large cement water troughs not to allow your horse to step in, as the depth of the trough is deeper than the surrounding ground. I had to keep a close eye on Angel because she just loves getting her hooves wet by rudely dipping them into the water and then pawing to splash water on herself, mucking it up for everyone else while cooling herself off. She is a smart character, always testing the waters. 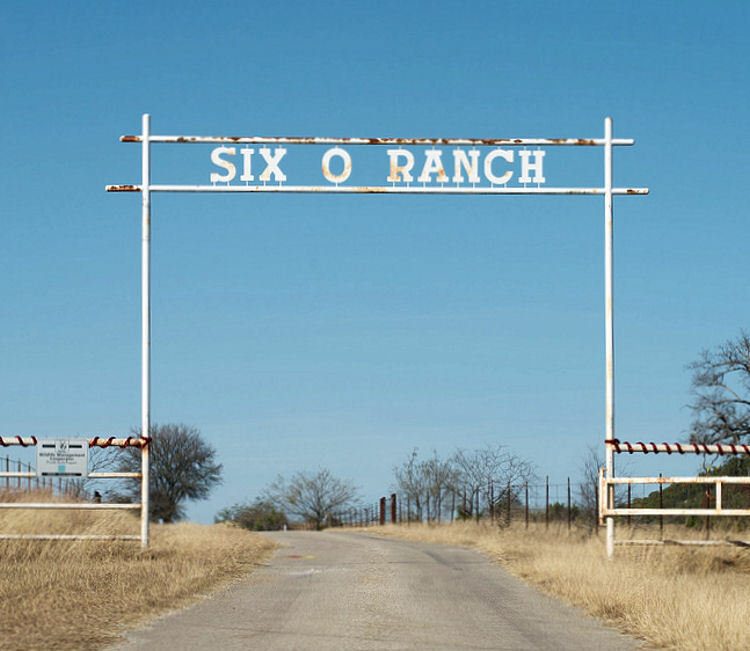 Since the Six O is a working cattle ranch there will be cattle on the property, and on the trail you will pass through a few gates. Please be sure to leave the gates as they were… if open, then leave the gate open and if closed then please leave the gate closed. I enjoyed the Six O Ranch this past January of 2012. 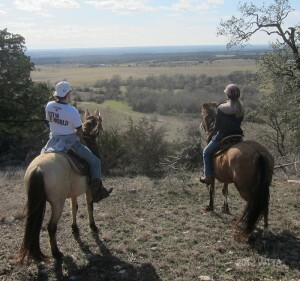 Liz Earley-Scott, a regular at the ranch, showed my brother and me the trails on the northeast side of the ranch. Liz is very friendly and knows these trails well. She is happy to guide riders unfamiliar with the Six O trails around. 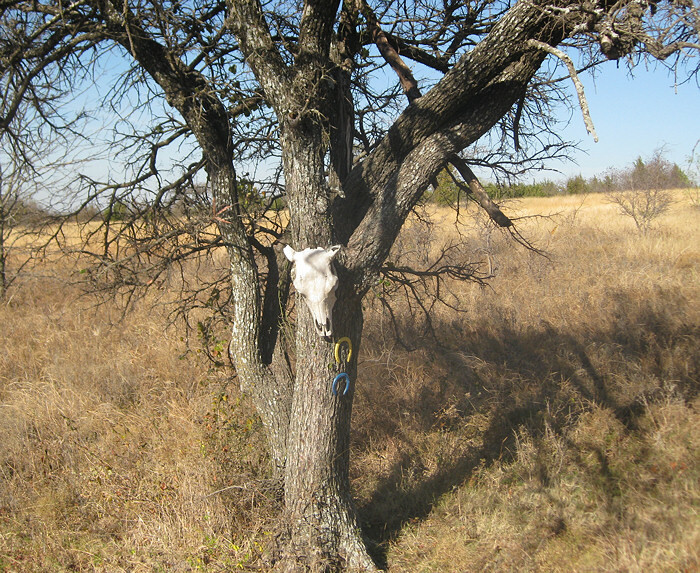 You can contact Liz through the Ranch’s FaceBook page listed above or shoot her an e-mail: tnwalkinga@msn.com . 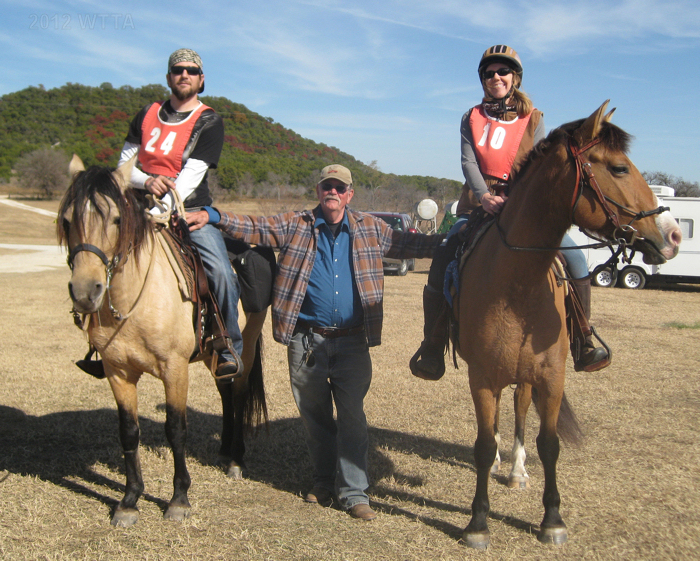 My first visit to the Ranch was over a year ago while participating in a North American Trail Conference competitive trail ride. My brother rode with me, my dad volunteered to help out at the pulse and respiration checks, and my mom stopped by for a visit. It was great family fun! My brother is fortunate to live within close proximity to the Ranch. He said he enjoys riding at the Six O because of the great views and nice trails. Six O Ranch trail marker, the trails are not well marked so you do need a map and/or a good sense of direction. The Six O Ranch trails, 12/2010.